Orchid has a big family clan and there are more than 20000 varieties of orchids in the world. Orchids mainly grow in tropical areas; China has altogether over 1200 varieties of orchids, which mainly grow in Yunnan, Sichuan, Canton, Guangxi, Hainan, Taiwai and Henan etc. Classifying from their biotope, orchids could be divided into two types: one type is the so-called aerial orchid, which mainly grow on trees and rocks by clinging to mosses and accumulated soils on the branches and tree forks; the other type is orchid growing on the ground, generally in marbles and sands. Orchids seldom grow in marshes or in wet soil. Besides, some orchids have no chlorophyll, thus have no photosynthesis, and they could only get nutrition from fungi; and this kind of orchids mainly grown in place where there are fallen leaves and humus. Chinese cymbidium are ornamental plants and are loved by many. They are often the topics of many poems, paintings and craftworks etc. Ever since ancient times, many men of letters left a huge amount of paintings, calligraphies, poems and articles about orchids; many of them express friendships, promote communications, and edify sentiments. Activities related with orchid have engaged in all economic, cultural, folk custom and daily lives of the Chinese people and orchid has become a part of the Chinese culture. 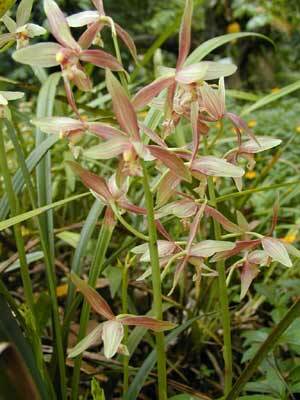 Another name for Chinese cymbidium is the Chinese orchid and it normally grows beside streams or mixed forests. Its blossom period is 2-3 months and they could have many flowers. Orchids have quite strong fragrances and their flower colors are also varied. Chinese cymbidium has strong aromas, peculiar leaves, and are the female parent of many ornamental orchids; therefore, it is always loved by many people. Now, we could find its trace in East China, South China and Southwest China etc.